Samsung's TouchWiz is the blessing and curse of Android. Some people love it, others hate it, but it seems to leave no place for neutral opinions. An overwhelming majority of people agree that it's a feature-rich skin and its huge popularity prove that there is something very good about it, but speed does not seem to be one of those things. That's why we were looking forward to see how Samsung changed TouchWiz, and good news is that at first sight it does appear to be a bit faster than before. The Samsung Galaxy S6 and S6 edge come with a brand new version of the TouchWiz user interface that is also changed in terms of visual style - it's sleeker, with a modern view taking clues for Material Design with color-coded apps and some (but not all icons) touched up. Of course, Android 5.0 Lollipop is under the hood, meaning you get the new card-based notifications, and all the other improvements coming with the latest version of Google's mobile operating system. Rather than talk about it, though, let's first explore it in this collection of Galaxy S6 TouchWiz screenshots. 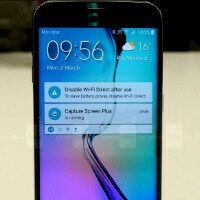 Really best user interface?, its an upgrade from past touchwiz, other would prefer sense etc. For myself the best user interface is the one that started this whole flat and clean trend that has caught on like wildfire. The RAM is not actively used, it is always almost full because the closed apps remain in the RAM so that they can be opened faster the next time you use them and to use less energy (deleting every app from the cache and then opening them again consumes energy and is useless). But if you need more RAM, the cache will be deleted, and it will be instantaneous thanks to the new LPDDR4. Any idea the number of bloat apps that is preinstalled with the phone? What is that "pro" feature in the camera app? Okay. But you can control the shutter speed? I like the improvements made for touchwiz and other Samsung apps. Do you think that they with be available as updates to previous Samsung devices and or updated through the Samsung Apps store? Does note4 will have this tw too? No... Almost every Samsung Galaxy smartphone has a different ui... Until an update like android lollipop where the ui is updated for every phone which receives it. Perhaps when the note 4 is updated to 5.1 well will see some features from the new touch wiz. I'm sold on this. Just when i was on my bragging rights parade for my Note 4, THIS! Damn Lord, have mercy on my pockets. Actually this is very good if the bloat were and lags are kept minimal. From what I see, Samsung did enough to game over everyone this year but if they put say a few billion to poach some Sense software designers next year, it would really game over game over. For once TW doesn't make my eyes bleed. I'm glad they finally changed the system fonts. Surely it is the apps that are loaded by default that cause the bloat and lag, not the launcher?